What could have been one of the most serious accidents in Boston transit history occurred on January 9, 1907. The original Orange Line had elevated sections to its north and south, with a loop on Atlantic Avenue. From 1901 to 1908, the "L" cars used to travel through the Green Line tunnel under Tremont Street. The above photo shows the switch tower at Washington and Motte (Herald) Streets, with a train heading north from Atlantic Avenue. The elevated structure that went to the Tremont Street subway is visible at the top. 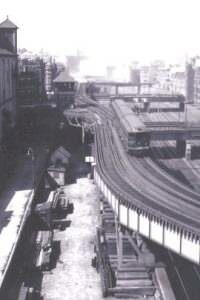 At 9:10 p.m., the operator of a four-car passenger train heading to Dudley Street (similar to the photo above) took the curve at Washington Street at a high rate of speed, which caused the last car to swing off the tracks and strike Tower D. Hitting the tower prevented the car from being hurled off the elevated structure and into the street below. Amazingly, due to the late hour and low passenger count, no one sustained serious injuries. "For an hour the passengers were imprisoned inside the car, which, after striking the tower house, careened toward the other track, throwing the passengers into the lower corner of the car, where they were huddled like so many sheep. "Presumably, the car hit the tower and then quickly bounced off it. One of the injured passengers describes the event, "When we were about to turn the curve near Columbia theater, I thought we were moving rapidly, and I still think I never traveled so fast in an elevated train. We got around the curve all right, it seemed, but suddenly there was a bumping accompanied by a grinding noise and I was thrown to the floor. Of course I did not know what happened, but I instantly recognized there was an accident of some kind. When the rear trucks of the car left the tracks, all the lights were extinguished, and looking out I could see a dark object, which afterward I found was the signal tower. We had struck that, and this brought the flight of the car to an end." Three injured passengers were treated by a doctor that was riding in a forward car of the train, and then each person was sent home in a carriage from their local transit stop. An "L" wrecking crane was dispatched south from Sullivan Square via the Atlantic Avenue loop, and the damaged car was placed on new trucks (wheels) and towed away. Normal service resumed the next day.